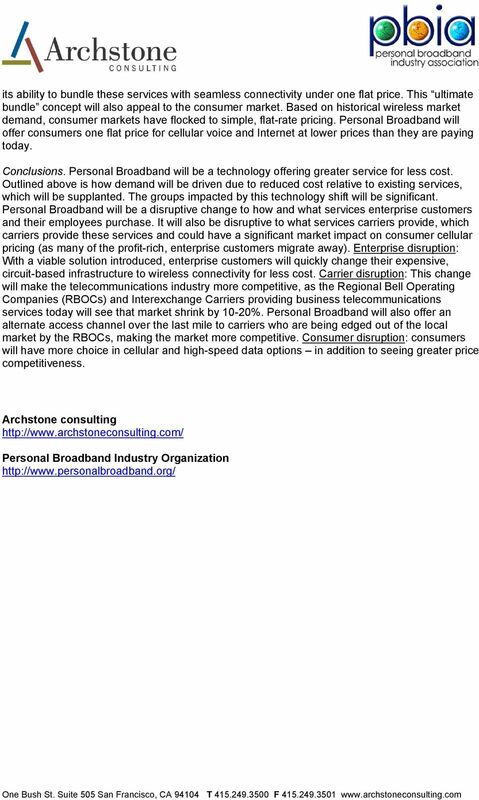 Download "Personal Broadband and the Enterprise Customer"
4 What will unseat dedicated local access? The dedicated T1 access circuit is the current cornerstone of many enterprises wide area networks, providing connectivity to Frame Relay, ATM, MPLS, etc. networks. While T1 prices have be greatly reduced over the past 15 years, they are still a significant cost to most enterprises and recent regulatory changes are sure to increase these rates over the next 12 months. Wireless broadband will offer a service that is equivalent to dedicated access in terms of quality and reliability at a lower price. 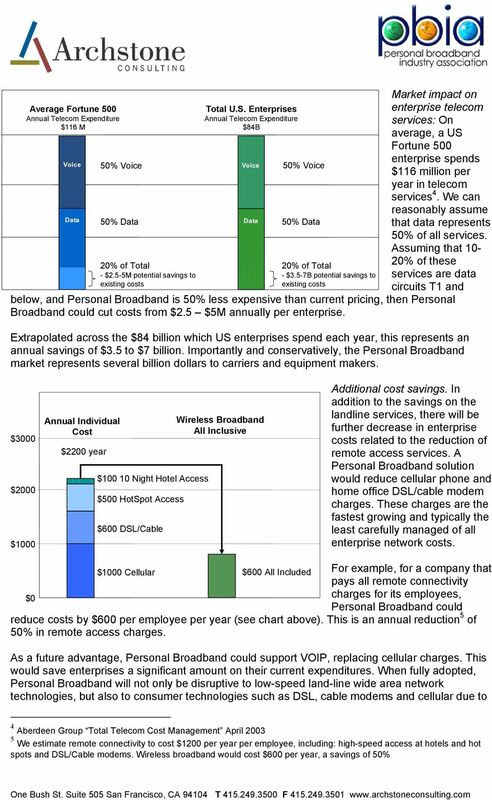 And as with any commodity model, price is the driver and Personal Broadband will be disruptive to enterprise data services. 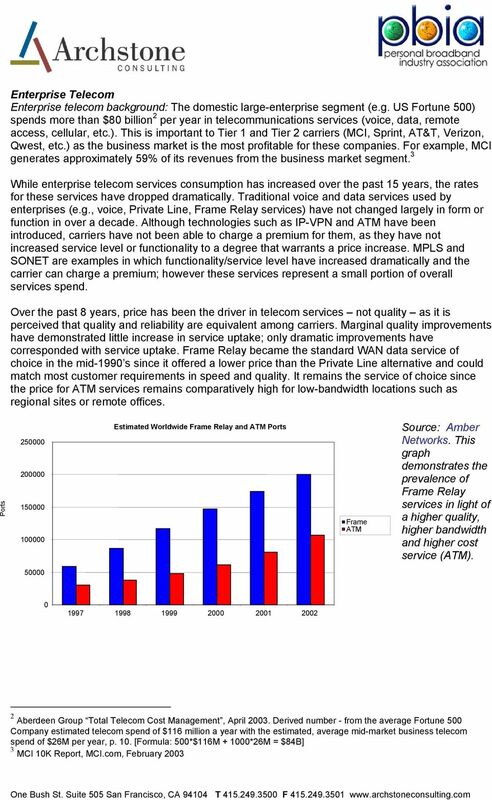 It will be different from other replacement technologies, as unlike the others, it both improves service (quality and bandwidth) while significantly reducing cost. As a result, Personal Broadband will replace dedicated local access at an accelerated pace. Largely, this replacement will be fueled by those stakeholders who determine the enterprise network topology, including: the CIO, network engineers and telecom managers who are all focused on reliability, availability and bandwidth; and the CFO and procurement organizations who are focused on cost. Why demand will grow faster. 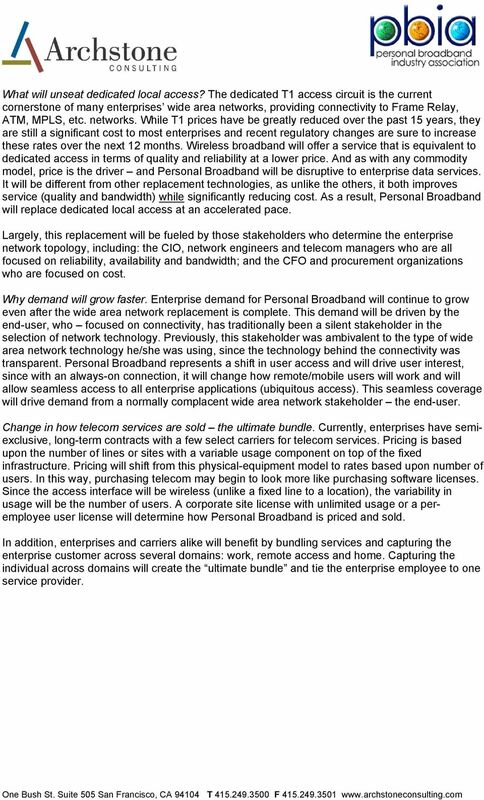 Enterprise demand for Personal Broadband will continue to grow even after the wide area network replacement is complete. This demand will be driven by the end-user, who focused on connectivity, has traditionally been a silent stakeholder in the selection of network technology. Previously, this stakeholder was ambivalent to the type of wide area network technology he/she was using, since the technology behind the connectivity was transparent. 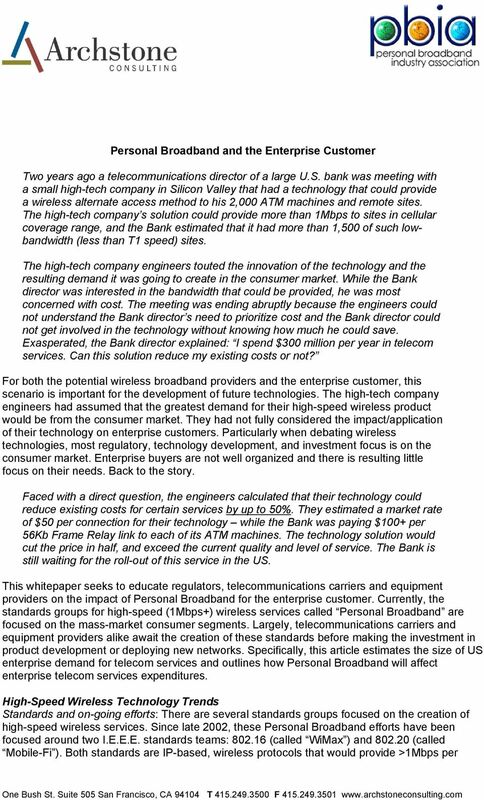 Personal Broadband represents a shift in user access and will drive user interest, since with an always-on connection, it will change how remote/mobile users will work and will allow seamless access to all enterprise applications (ubiquitous access). This seamless coverage will drive demand from a normally complacent wide area network stakeholder the end-user. Change in how telecom services are sold the ultimate bundle. Currently, enterprises have semiexclusive, long-term contracts with a few select carriers for telecom services. Pricing is based upon the number of lines or sites with a variable usage component on top of the fixed infrastructure. Pricing will shift from this physical-equipment model to rates based upon number of users. In this way, purchasing telecom may begin to look more like purchasing software licenses. Since the access interface will be wireless (unlike a fixed line to a location), the variability in usage will be the number of users. 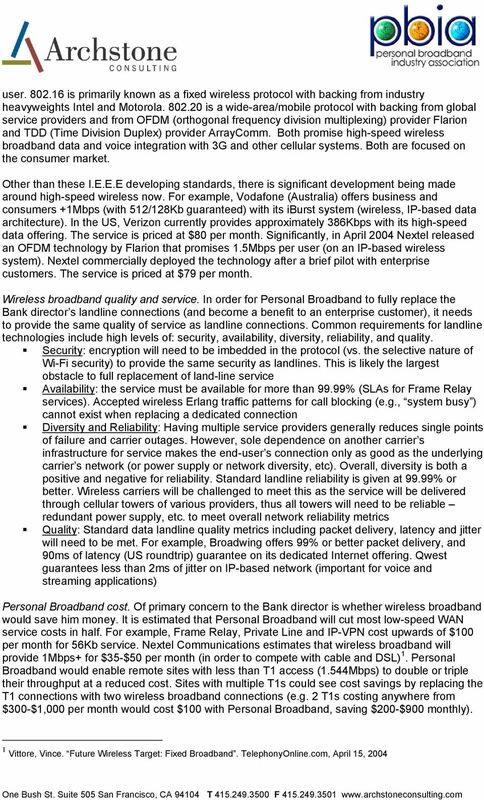 A corporate site license with unlimited usage or a peremployee user license will determine how Personal Broadband is priced and sold. In addition, enterprises and carriers alike will benefit by bundling services and capturing the enterprise customer across several domains: work, remote access and home. Capturing the individual across domains will create the ultimate bundle and tie the enterprise employee to one service provider. WHITE PAPER: Broadband Bonding for VoIP & UC Applications. In Brief. mushroomnetworks.com. Applications. Challenge. Solution. Benefits. WHY CHOOSE COX BUSINESS FOR YOUR COMPANY S NETWORK SERVICE NEEDS? White Paper. D-Link International Tel: (65) 6774 6233, Fax: (65) 6774 6322. E-mail: info@dlink.com.sg; Web: http://www.dlink-intl. Figure 1. Traditional PBX system based on TDM (Time Division Multiplexing). Colt IP VPN Services. 2010 Colt Technology Services Group Limited. All rights reserved. Qwest Choice Business is the simple way to increase the productivity and efficiency of your communication system without increasing the cost. Your Wide Area Network Just Got a Whole Lot Wider. Unified messaging is provided to over 1,000 users today and continues to increase along with campus growth. R e v o l u t i o n i z i n g Broadband Services with GPON Higher Performance at a Lower Cost Service providers face intense competition to provide triple-play services in today s broadband access markets. Wi-Fi Calling (and Texting) For Mobile Operators How Operators Can Leverage Existing Wi-Fi Networks to Solve Voice Coverage Challenges within the Home Kineto Wireless, Inc. Worldwide Headquarters 670 N.
White Paper January 2011 Introduction In today s demanding business environment, few companies can afford having a key facility or branch location go off-line, or face service interruptions at headquarters. Mobile Voice ~ Whispers of Change?